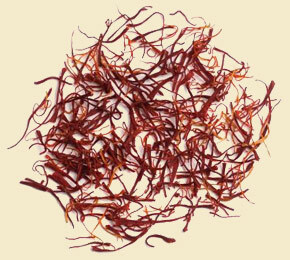 Saffron is a spice, derived from the Crocus sativus (saffron crocus) plant. It is of Southwest Asian origin. The usage of Saffron for its medicinal properties is legendary! Ever since the Phoenicians Saffron has been used as a treatment for melancholy. It is said that Alexander the Great used it with rice, as well as in his bath as a treatment for battle wounds. Cleopatra also used it in her baths, but rather for its sensual properties, in order to enhance the love making. Another interesting use for Saffron is as a wine aromatizer. Nowadays, Saffron is also known for its anticarcinogenic (suppressing cancer) and anti-mutagenic (preventing mutation) properties. Saffron is also beneficial to the eyes. It slows down age related macular degeneration and retinitis pigmentosa (a group of genetic eye conditions). In the old days, Saffron threads were placed in the bed and added to hot tea, as a cure for melancholy. Saffron is not toxic. However, it should not be confused with meadow saffron, also called wild saffron or Autumn crocus (Colchicum autumnale) which is deadly. The "meadow saffron" looks similar to the true crocuses, but flowers in autumn. Salvia officinalis, also called Garden sage, Common sage or just Sage is a short woody plant from the Lamiaceae family. The term 'sage' is used to describe various species from the Salvia genus of approximately 700-900 species of plants, however when used by itself, so just sage, then it refers to Common Sage (Salvia officinalis). The leaves should be gathered before flowering in May and can be used fresh or dried. Sage has always been a highly valued herb for its healing properties. It has antibiotic, antifungal, antihydrotic (prevents or decreases perspiration) antiseptic and antiviral properties. Sage calms down nervousness, it heals digestive problems, and helps with respiratory problems. Sage also remedies excessive sweating and can take care of night sweats. 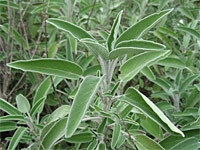 Sage is often used for gargling or as a mouthwash to treat irritations and inflammations in the mouth and/or throat. Sage tea can dry up breast milk! Nursing mothers should not drink sage tea, unless they wish to discourage milk production. Sometimes a single cup of sage tea is enough to completely stop lactation. Salvia is the largest genus from the the Lamiaceae family of plants. The genus consists of about 700-900 species, with the most famous being the Common sage or Salvia officinalis. The word salvia comes from Latin salvere, which means 'to be in good health'. Similar healing properties to Salvia officinalis. Considered sacred by many Native Americans, and often used in spiritual practises. Cleanses any space of negative energy and/or evil spirits through burning leaves. Used by Mazatec shamans during healing or divining sessions. Only fresh leaves are used in this way, either by crushing them to extract the juice (which is mixed with water as a tea drink), or by eating the leaves whole. The dried leaves can be smoked. A psychoactive plant, an entheogen, which induces a dream-like, trance state. It contains Salvinorin A, one of the most potent natural psychoactive substances. It is not toxic and there is no evidence of chemical dependence. Slightly inferior quality to Salvia officinalis, but easier to grow indoors. The most common dried sage in North America. The leaves exist in many different shapes. The seeds are rich in omega-3 fatty acids, and a source of antioxidants. 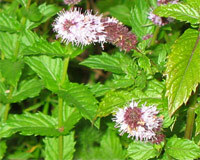 Mentha spicata is a mint species, which gets its common name spearmint thanks to its leaf tips, which are pointed like spears. Nana is a famous cultivar of Mentha spicata, and an ingredient of Touareg tea, important in North African and Arabian countries. Spearmint tea is traditionally a remedy for stomach ache. According to recent studies, spearmint can be used to treat mild forms of excessive hairiness in women, which is primarily a cosmetic, and not a physical concern, but may be a symptom of another medical condition. Spearmint is non toxic. Spearmint essential oil, when used as recommended, is non toxic. Stinging nettle (Urtica dioica), also called common nettle or burn nettle is the most famous of all the nettles. It likes a moist soil and it reaches its peak of 1-2 meters (or 3-7 feet) in the summer, dying down to the soil at the end of the season, in winter. Stinging nettle is rich in iron, calcium, magnesium, vitamins A, C and D.
Stinging nettle is a flowering plant with hairy leaves, some of which are stinging (trichomes) and some non-stinging. Touching the delicate trichome makes it come off and inject several chemicals which is what causes the sting. Extract of stinging nettle has various medicinal applications. It is used to treat arthritis, hay fever, anemia and kidney problems. It also encourages milk flow in nursing mothers. 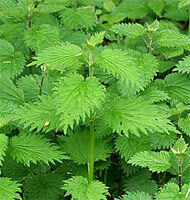 Stinging nettle is used in shampoos to control dandruff. It is also said to make hair shinier. There are claims that stinging nettle can help hair grow back in the bald spot. This is supposedly done by rubbing the scalp with fresh stinging nettle. Be advised that this would be somewhat painful and it would itch. You can use one of the natural antipruritics to ease the itching afterward, if you want to try this. There is a number of natural herbal remedies to treat the itching that results from the nettle sting: Jewelweed (impatiens), mint oil, or camphor. See antipruritics for additional natural remedies. Urtication, which is a gentle "beating" or lashing of oneself with bundles of stinging nettle is a typical ancient folk remedy for rheumatism and arthritis. The irritation that results from the stings stimulates the circulation, nerves and the cellular metabolism. The seratonin and the histamine which are 'injected' into the skin block inflammation-producing immune cells and encourage inflammatory deterioration. Stinging Nettle is a safe plant. Aside from the well known pain/irritation that results from the nettle sting, eating fresh (young) or dried plants has no known nor notable side-effects. St John's wort (Hypericum perforatum) gets its common name from the day it is traditionally harvested on, which is St John's day (June 24). In some cases, taking high dosages over prolonged periods can cause photosensitivity, though this is a rare reaction. Mixing with other prescribed antidepressants is not a good idea, as it can cause Serotonin Syndrome, an adverse drug reaction, as well as a number of other side effects, such as nausea, confusion, headaches or anxiety. 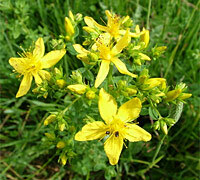 St John's wort is poisonous to cattle, sheep, goats and horses, if ingested in larger doses. Some of the symptoms of poisoning are skin irritation, restlessness, panting, hyperactivity, and confusion. 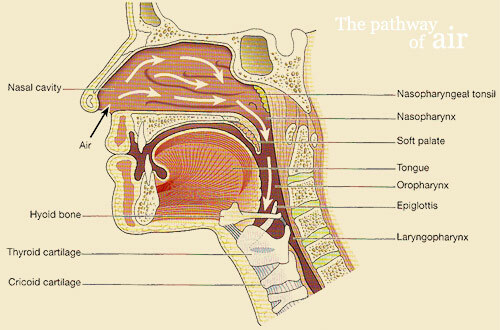 Rhinitis or stuffy nose is mostly a symptom of a nasal inflammation which results in excessive mucus production. Infections of an upper respiratory tract lead to a runny nose or a stuffy nose. Another common reason is an allergic reaction (see hay fever and hives). In case the stuffy nose is caused by an inflammation, most of the suggested treatments for a common cough would also benefit the nasal cavity. Thrust your tongue against the roof of your mouth, then press with one finger between your eyebrows. Repeat the above several times. The repetitious motion loosens congestion after about half a minute and the sinuses begin to drain. Eating spicy food (hot peppers, onions, mustard, etc.) also helps drain the sinuses. If you don't feel like eating spicy food, cut an onion instead and start crying. Your sinuses will start flowing too, and not just your tears. One drop of peppermint essential oil on your pillow will help you breathe better through the night.